This book does indeed list 99 ways to make money from selling your photos. The assumption is that you're already a competent photographer, and if that's so then this book, along with some creativity, imagination, and hustle on your part will help you to begin to make money from your photographs. Packed with insider tips, practical strategies, and case studies, the editors of the successful Photopreneur blog reveal 99 creative ways to make money from your photography. Each chapter reveals what to shoot, how to break in, and where to go to generate sales. Discover how to sell stock, approach galleries, host your own exhibition, earn with Flickr, shoot for social networking sites, create and market photo products, form joint ventures, upsell your event photography and much, much more. From beginners to enthusiasts and from hobbyists to professionals, 99 Ways To Make Money From Your Photos can help anyone earn income from their talent. 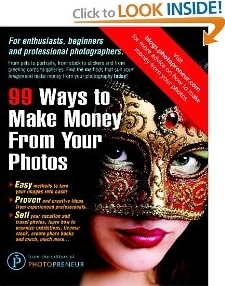 J. Russell of Florida says, "This book does indeed list 99 ways to make money from selling your photos. The assumption is that you're already a competent photographer, and if that's so then this book, along with some creativity, imagination, and hustle on your part will help you to begin to make some money from your photographs. "What I especially like about this book is that each way to make money rates how difficult it is to make money with that particular tip, the amount of competition you'll face, and that tip's income potential. Each tip is described in detail and includes how to get started and tips for success! In some cases specific web sites, etc., are included as possible outlets for your work. "If you're already a good photographer, and you're willing to take this book and really work hard at what it teaches you, then you should begin selling your own work soon. I have!" 2. Sell Your Photos "Royalty Free"
3. Sell Your Photos "Rights Managed"